Would you hit “send” on this one? I just couldn’t help myself. I wanted to write more. I wanted to tell this lady that I understand this thirst and this searching, but running to a human to point you to another human is like taking a big trip around a cul-de-sac; it’s short and you just end up back where you started. But this is where we are at. We bombard ourselves with what everyone else thinks before taking any consideration that God actually has better thoughts and truths than all of us put together. The amazing thing is that He wants to impart all of it to us. ‘m convinced our brains have been reprogrammed for quick results and human approval. We are losing that desire to sit quietly and listen to God’s voice through His Word. Not the ability… we all have that. The desire is lacking. We prefer someone else’s experiences over our own. We want someone else to define truth for us, to outline it in a way that makes sense. There’s nothing wrong with that of course, until it replaces our own genuine experience with God and His Word to us specifically. We learn through experiences, but life can go sideways sometimes. We devour the latest books, but authors are just people like us. We get sidetracked by superficial and we begin to trust other things more than we trust His Word to us. Want to find out what grace REALLY is? Open His Word. Grace is what God did for us, His unmerited love towards us. It’s all in there. If you keep seeking it out, you’ll see more and more of the big picture. You’ll see that faith is our response to His grace. You’ll see how it all fits together and how we are created to walk in ALL the truths of His Word as a whole, not just one virtue or concept at a time. One person’s thoughts on grace may be good and interesting. How about we see what God Himself has to say about it as well? 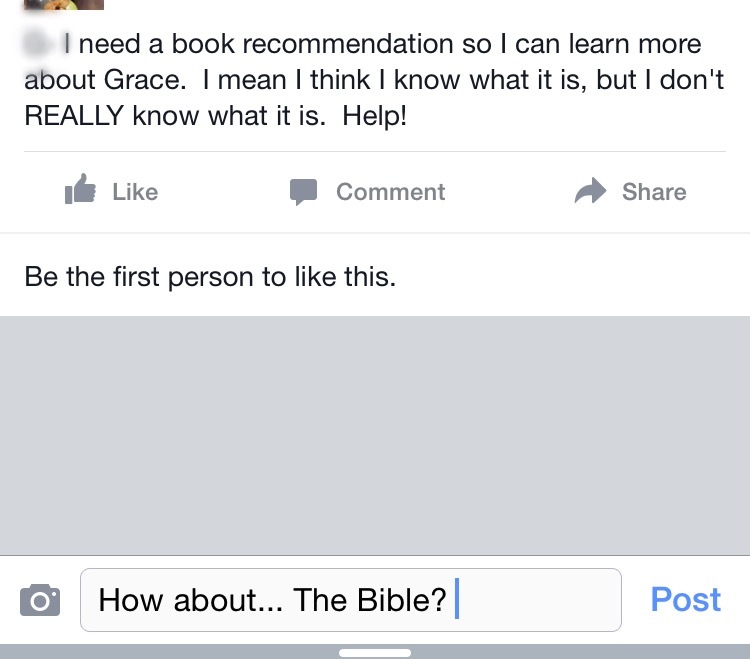 I’ve had friends ask me “what does the Bible say about…” and I’m happy to offer my two cents. I’m happier to point them to the Word and let God reveal Himself to them. He is in there you guys. It may not seem like it, but give Him the time He deserves. It will be a challenge and it may not be as fun as the new book you just bought, but I promise you, it will be more. He is no respecter of persons. (Acts 10:34) He’ll show up. The very author of your faith will show up and show you what REAL grace tastes like. You can’t get it from a commentary or from someone else’s experiences. The Bible isn’t obscure or too hard for us. (2 Peter 3:16) No degree needed. No extra knowledge necessary. Just an open heart and your attention. Uncertainty is NOT the new truth. Being fuzzy on things isn’t the new humility. People are willing to kill for a lie and yet so few are willing to speak up for the truth. Christians, please know the Word. Study it, stand up for it, and love it. It is all we have in the world that will not change. Let it be the first place we go with our questions – it’s a win/win situation. God will not fail to reveal Himself, not ever. It’s up to us whether we accept what He says. Let the Word challenge you, let God paint a picture that is just for you. It will be better than anyone else’s you could ever seek out. Hi Scase, this is an interesting post. I wouldn’t hit send on that message just yet, because it assumes that the enquirer hasn’t already read the scriptures. The question may have something to do with what they are currently experiencing, and they may not really know how to connect their trial with scripture. There are so many things that we are still learning years after we come to the faith. I recently gained a deeper understanding of God’s grace myself. Though, it didn’t come from outside, it also didn’t come from Bible study. The Word was already hid in my heart. God, who lives in me, granted me the higher understanding when I was more thirsty for it, just like He opens our eyes to new revelations in scripture. God can use us to teach our brethen in times when their understanding is cloudy. You can use the Bible, and when you explain the Scriptures to them, and connect it to their experience, it is likely they will never forget it. God still uses us to minister to our brethen and lives in us for that purpose. But you’re right that we should point people to God and not encourage dependence on others. Sometimes saying go and read your Bible can be condescending even if it is true. Listen to God’s spirit within and He’ll guide you on how to answer an enquirer. Hi dear… I posted a comment earlier, but it’s not showing. Hi! Thank you for it… So appreciate your thoughts, I’m having an issue with signal today, things aren’t posting… Hopefully when I get home to a real computer?! Phew! Was wondering if I’d offended you… cool, later then! It’s true as Ufuoma said, God does use us to minister to one another. But it is also true that we all need to get into the word for ourselves. The Bible tell us thats how we grow, by desiring the sincere milk of the word! (1 Peter 2:2). Thanks for following my blog. I am blessed by yours! Haha, I am all for that idea! !